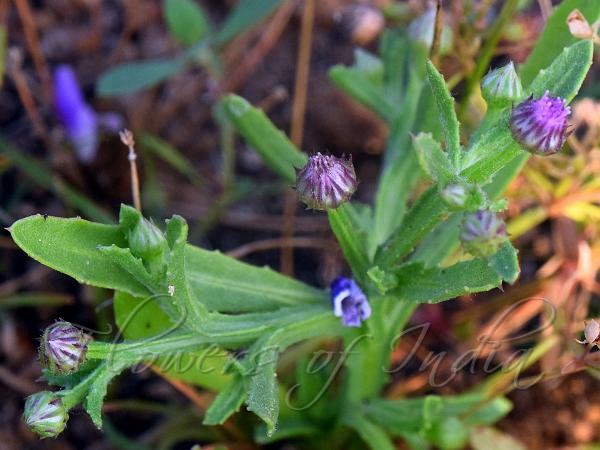 Narrow-Leaf Epaltes is an erect annual herb with branchlets winged. Leaves are simple, alternate, lanceshaped to oblong, 3-7 by 0.7-1 cm, base wedge-shaped, decurrent, margin faintly toothed, tip pointed, leathery. Flower-heads are pink to purple, heterogamous, disc-like, 1-3 in clusters at branch-ends. Bracts are many seriate, scarious; florets are pink to purple, outer florets female, inner bisexual; pappus 0; florets tubular; stamens 5, included . Ovary is linearly oblong. Seed-pod is is oblong. 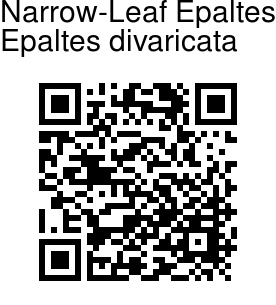 Narrow-Leaf Epaltes is found in South India, China, Myanmar, Indonesia and Java. Flowering: December-February.